Repurposing Drugs to Treat Zika Infection | Health Research, Inc.
High throughput screening has led to identification of several existing drugs that can inhibit the viral protease function of Zika virus (ZIKV). The candidate drugs can significantly inhibit the growth and replication of not only Zika virus (ZIKV), but also Dengue virus (DENV), West Nile virus (WNV), Japanese encephalitis virus (JEV), Yellow fever virus (YFV), St. Louis encephalitis virus (SLEV), and Powassan virus (POW), with efficacies from micromolar to nanomolar. Dr. Li’s team further demonstrated that these drugs inhibit virus replication via a mechanism of inhibition of the viral protease function. Two of these drugs (nitazoxanide and niclosamide) have potential for prophylactic use, perhaps even in pregnant women, based on their strong safety records, although further experimentation will be required to confirm this application. Compound A: Niclosamide – Previously FDA approved (discontinued), FDA pregnancy category B, broad antiviral activity including against ZIKV, DENV2, WNV, JEV, and YFV. Niclosamide is not considered a developmental toxicant in mammals , and is a safe drug even for long-term use. Niclosamide was also reported to effectively treat pregnant women with tapeworm infections [57, 58]. In our studies, niclosamide inhibited virus growth not only at early stage, but more importantly, at 24 h pi. The results suggest that niclosamide acts at a post-entry step. Overall, our data suggest a novel mode of action for niclosamide. New analogs and formulations are under development. Compound B: Temoporfin (Foscan) – The most potent compound, inhibited ZIKV replication in human placental and neural progenitor cells, and also prevented ZIKV-induced viremia and mortality in murine models. Additional studies are underway. 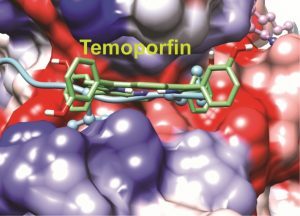 It is currently not known whether temoporfin is genotoxic. However, its high anti-flaviviral potency demonstrates its promise as a possible treatment for WNV, JEV, DENV, YFV, and non-pregnant ZIKV patients who may face increased risk of Guillain-Barre syndrome, encephalitis, and other complications. Further studies will be required to evaluate the potential benefits and risks for pregnant patients. Compound C: Nitazoxanide – FDA approved for pediatric and adult use, FDA pregnancy category B. Nitazoxanide is a broad-spectrum antiviral agent including, against ZIKV and DENV2, with an extensive safety record. Our studies suggest that nitazoxanide inhibits the interactions between the NS3 protease and its co-factor component NS2B. Although there are no adequate and well-controlled studies in pregnant woman, research shows nitazoxanide does not adversely affect male or female fertility, nor does it appear to impair fertility or harm the fetus in rats and rabbits . Background: With the recent outbreak of Zika virus and its link to birth defects including microcephaly, there is a renewed sense of urgency to develop therapeutics to manage flavivirus infections. Researchers at Wadsworth Center developed a high throughput screening (HTS) assay based on split luciferase complementation (SLC) to identify orthosteric inhibitors blocking the interactions between viral proteins NS2B and NS3, both of which are essential components of the viral protease. This high-throughput screening system enabled us to screen a pharmaceutical library of 2,816 drugs, significantly reducing the 10 year average time it takes for a new medicine to make its journey to the marketplace. Our results identified compounds with broad spectrum flavivirus protease inhibition with high potency using various biochemical, biophysical, and virological approaches. In vitro inhibition studies of flaviviruses including Zika, Dengue, West Nile, Yellow fever, Japanese encephalitis, St. Louis encephalitis, and Powassan viruses completed. In vitro inhibition of Zika virus replication in human placental cells completed. In vitro inhibition of Zika virus replication in human neural progenitor cells completed. More potent derivatives of niclosamide identified. 56. Krieger R. ed. Inhibitors and Uncouplers and Antiparasitic Agents. San Diego, CA: Academic Press, 2001.